It’s also easy to make, with simple ingredients. The only ones you may need to work at finding are the canned roasted tomatoes and the raw cashews (and fresh herbs). Despite its richness, it has a respectable nutrition scorecard and there’s no “ugh, what have I done” feeling afterwards, even after multiple servings. I would know! The only yellow flag nutritionally is the sodium, which you can mitigate with your choice of broth. 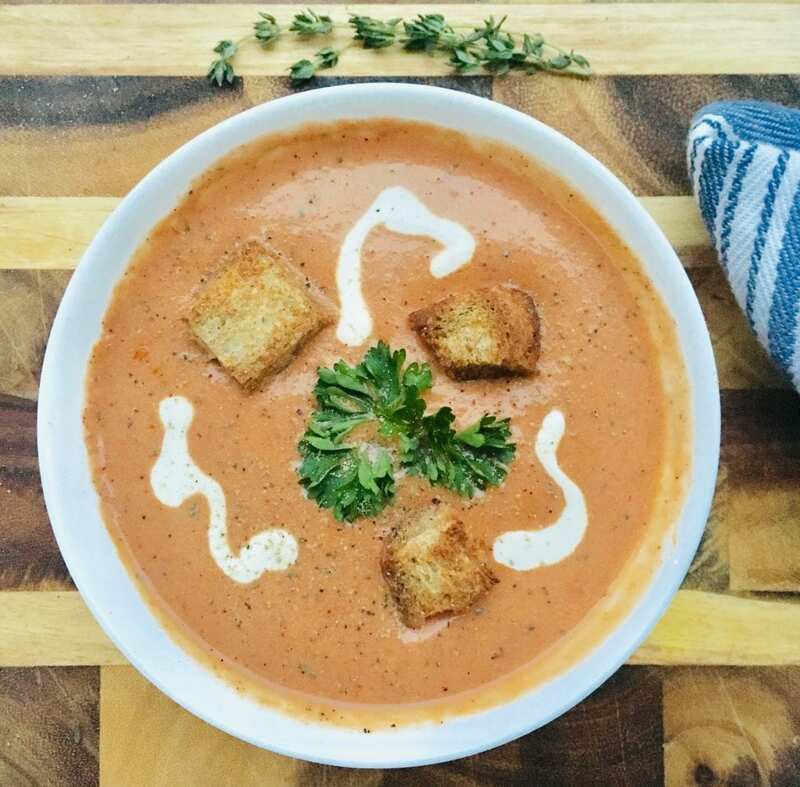 Since the soup itself is relatively light on calories, consider adding homemade whole wheat croutons. Pair with a hearty salad, perhaps a vegan caesar salad or a spinach strawberry balsamic salad with a generous sprinkling of chickpeas. Still hungry? Add a slice of toast with smashed white beans and sundried tomato or pesto. Place a large stockpot over medium heat. Sprinkle the bottom with a pinch of salt and heat for 1 minute. Add the margarine and stir until melted, being careful not to let it burn. This will create a nonstick effect. Add the onion, carrot, celery and garlic and cook for 10 minutes, stirring frequently. Sprinkle the flour over the vegetables and continue cooking and stirring for 2 minutes. Add the stock, tomatoes with juice, parsley, thyme and bay leaf. Bring to a boil, then reduce heat and simmer for 30 minutes. Prepare the cashew cream: blend the cashews in water until smooth. Add most of the cream to the pot but save some for serving if desired. Continue to simmer (do not boil) for 10 minutes. Remove the bay leaf then blend until smooth. Use hand blender or batches in tabletop blender. Top with with desired garnishes. Fresh pepper is a must. We like parsley for colour, extra cream for artistry, and croutons for added ‘oomph’! Spray or brush a few pieces of bread with olive oil, then smear with garlic (powder or real deal) and herbs (oregano, thyme, rosemary work well). Cut into cubes and bake for ~ 10 min, tossing midway. Recipe from Tal Ronnen’s Conscious Chef cookbook. We have adapted it only slightly. Three cheers for supernanny Paula for perfect execution of the recipe, every time. Thanks to Laura at Edibiliciousphotography for helping me snap a most inviting photo!